Last Saturday we took a drive out to the Orono Antiques Street Festival. It was an absolutely gorgeous day to be out wandering. Lots of folks out shopping. I only bought two items, and one of them was a piece of linen and the other was another centre handle server (not yet photographed). I bought this server recently, although I can’t recall where I got it. I have been in and out of antique stores and thrift shops alot in the last couple of weeks. Likely at St. Jacobs Antiques Market as I know I had a box full last weekend. In any event I have quite a number of these servers. I know that ‘folks in the know’ can often recognize the manufacturer by the shape of the handle. I am NOT one of those folk but I haven’t yet made any serious attempt to figure out an ID. I don’t know why I pick up these servers as I rarely use them. But….this one has such a bright colour that you can’t help but look at it. Makes a table look cheery. Already updated (later same day). Nice of this gentleman to take his time to ID this for me. Last week I wrote about going to the wonderful shop Around the Block in Toronto. 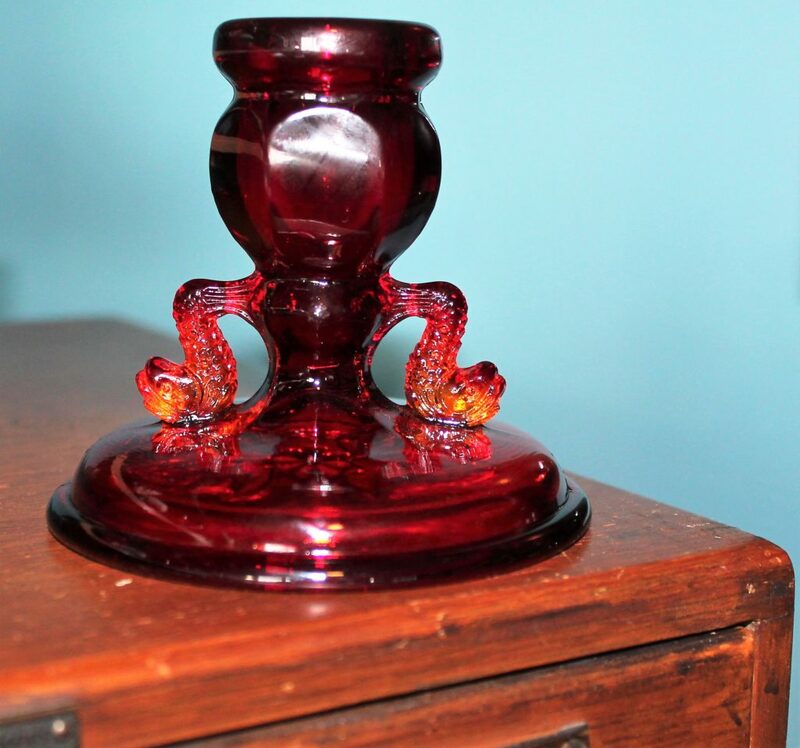 This pretty red piece was one of the items I picked up. I have long sold the amberina compote below. It was a gorgeous combination of red and yellow. 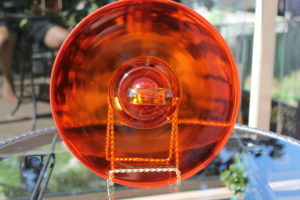 This piece is strictly red, but it has shades of yellow in it, visible when the sun shines. I guess this is a claret or whatever – but regardless of the beverage that is intended to be poured into this glass, it appears to be another piece of Moon and Stars. However the ID is unknown. 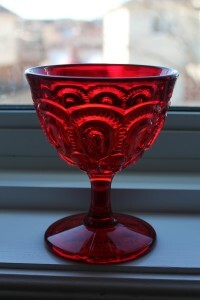 A post/photo of a similar glass has been added to the gallery of the Elegant and Everyday Glass Forum (a fab website!). The post indicates that L.E. 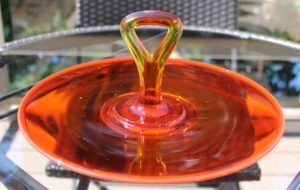 Smith never made a solid red – just the amberina as seen below. The post further says that the L.G. Wright Glass Company produced a moon and stars pressed glass, but not of this shape. Check out the site for more great information, including a link to the Moon and Star Glassware – Yahoo Group. This ebay guide Moon & Star Pattern Glass, written by Simple Pleasures is also interesting. I am going to continue to try to track down the provenance of this pretty piece. Keep you posted! I picked this pretty piece up in the States somewhere. 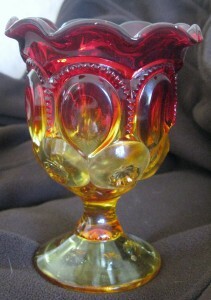 The colours attracted my eye and it looks very nice with a display of either red or yellow glass. It has all the markings of a piece of Moon and Stars, but I’ve not seen the pattern produced on a blank with a ruffled edge, so don’t know for certain that L.E. Smith made it. I’m not sure it’s a compote either. It’s a big large for a goblet, but somewhat narrow for a compote. On ebay I see lots of goblets and the sellers date them as 1940-1960. I’d love to verify the provenance. If anyone knows…..please share.